I love my Watch I love watches in general. I had worn watches daily since I was 8-9 years old. I had always preferred analog watches to digitals and worn them almost exclusively. This is because I like to just stare at an interesting watch-face and see the movement of the dials. My only analog trend ended in 2015 when I got my first Apple Watch the original Series 0. And a watch I still own and will keep no matter what. I had since upgraded to a Series 3 last year and my current Series 4. In short, I had used an Apple Watch almost daily since 2015 and is hard for me not to use it. I am just addicted to all the data I gather daily and how convenient the notifications are. I haven’t taken my iPhone from silent since 2015 I don’t even know how it sounds anymore lol. And in case anyone is curious how I managed to ditch analogs so easily, well the truth is I didn’t. I still wear analog watches regularly this week I am rocking my Bulova Lunar Pilot Special Edition and I love it. But I still wear my Apple Watch. Wearing two watches at the same time? Well yeah, that's what I do but I only wear both on each wrist when I have a long sleeve so that the Apple Watch will be concealed but when I am wearing shorts sleeves I will still wear the Apple Watch on an armband by TwelveSouth. I know this may sound extreme for some but I just like the beauty and simplicity of analog watches and the data and health benefits of the Apple Watch. The Apple Watch has some interesting faces my favorite being the Simple, Infograph and Infograph Modular. But the issue I have is not been able to just stare at them and that brings me to my main wished item. I want an always-on screen. I don’t want the need to tap the screen or raise my arm in order to appreciate the watch faces. And if an always-on screen isn’t possible on the next version what about a longer stay on time something longer than the current 60 seconds 5 minutes as the minimum will be acceptable to me. That request bring us to wish item number two. I want more battery.The battery on the current Series 4 is acceptable lasting me almost 2 days on a charge but 5-7 days will be even sweeter. But I will be fine with the current 2 days as a compromise for an always-on face. Talking about watch faces I will love to have more options preferably premium versions. I am not asking Apple to open watch faces designs and sales to anyone but at least offer a selection of curated premium faces available to purchase. This will allow for more individuality and personalization. In short I want more watch face. And finally I want more health data to be gathered automatically. Let’s start with sleep tracking and maybe glucose levels tracking. In short, I want even more data. So there it is my wish list is very straightforward. And now let’s just wait until next year and see what we get. If you have grown tired of your current Apple Watch band or just will like to add some variety to your arsenal of bands but find Apple Bands to be overpriced or just rather save the cash for the iPhone 7 then here are some of the best affordable third-party options. This band takes some serious inspiration from Apple’s original Milanese band but this one comes in four colors black, gold, rose gold and silver. Oh, and the best part is just a fraction of the price from Apple’s offering selling for a bit under $15. It’s one of the best selling bands on Amazon and it has an almost perfect 5 start review rating with over 3000 reviewers praising it. Here is another highly reviewed band. With over 3000 reviews and an almost 5 perfect rating, this band is perfect for those looking for a more traditional sports band. It comes in four colors and at the time of writing, the price is just $8. This is one of the best selling and highly rated Leather bands. It looks amazing and it just under $12. If you are looking for the ultimate in style and elegance this stainless steel link bracelet has no rival. With thousands of positive reviews and awesome look for a fraction the cost of Apple’s link bracelet this one will surely elevate any Apple Watch Sport look at a fraction of the cost. 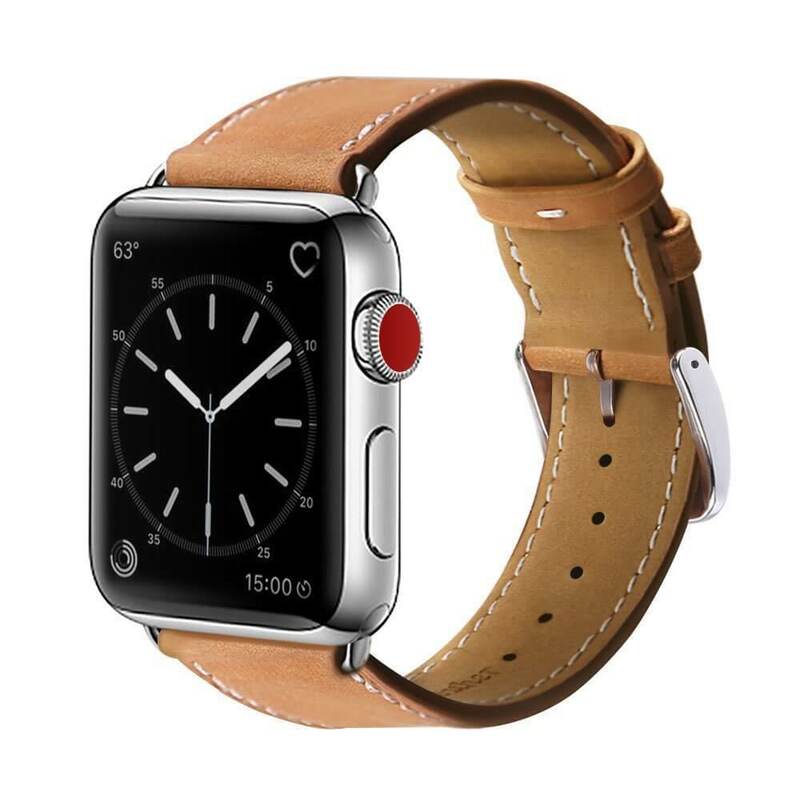 This elegant leather band comes in multiple colors and sizes and will give any apple watch a high-end look for under $10. It has an almost perfect 5-star rating and over 1000 reviews. If you are looking for a brown leather strap but with a less vintage more modern look this one can’t be beaten. Highly rated and one of Amazon Best Seller this one is a must-have. If you love the look of the Apple Nike inspire watch band but cringe at the price. This highly reviewed and I mean highly since it has over 3000 reviews is just 1/5 the price and come in a huge selection of colors. If what you are after is a band and case combination that is rugged and will protect your Apple Watch no matter the environment then this combo is for you. An almost perfect rating with over a thousand reviews this one is a no-brainer. This band comes in 15 colors and will give the Watch a very high end and refined look for under $14. This band will give your Watch the same look as the official Watch Sports band but it will only set you back $10. It also comes in 10 colors to choose from. I have compiled a previous list and the bands on that list are all a great buy check that list HERE. This nylon woven band has a 4 out 5 rating with excellent reviews and come in a huge assortment of colors in both 38mm and 42mm sizes (almost 40 varieties). The woven nylon bad does not only feels good it also includes a free silicon sport band. This band quality is amazing I am currently using one and love it. It also cost less than Apple’s official woven nylon band. If you are looking for a sporty band and likes the look of the new Apple Nike+ band then you will like this Covery band. It has great reviews with buyers praising the great build quality and confort. You can’t buy this band directly from Apple or Nike unless you buy a whole new Apple Watch Nike+ edition. But you can get this replacement in a assortment of colors for both the 38mm and 42mm Watch. If you are looking for a replacement silicon band you need to look at this FanTek band. With almost 1700 reviews at the time of this writing and an average rating of 4.5 out of 5 you will expect this band to cost more but at just 1/5 the cost of the official Apple version this one is a no brainer. Reviewers like the build quality, confort and exceptional value provided by this band. This band also comes in a huge assortment of colors for both the 38mm and 42mm Apple Watch. This beautiful band has almost a 1000 reviews and a 4.5 out of 5 average rating. This band is made of genuine leather and comes in brown or black. 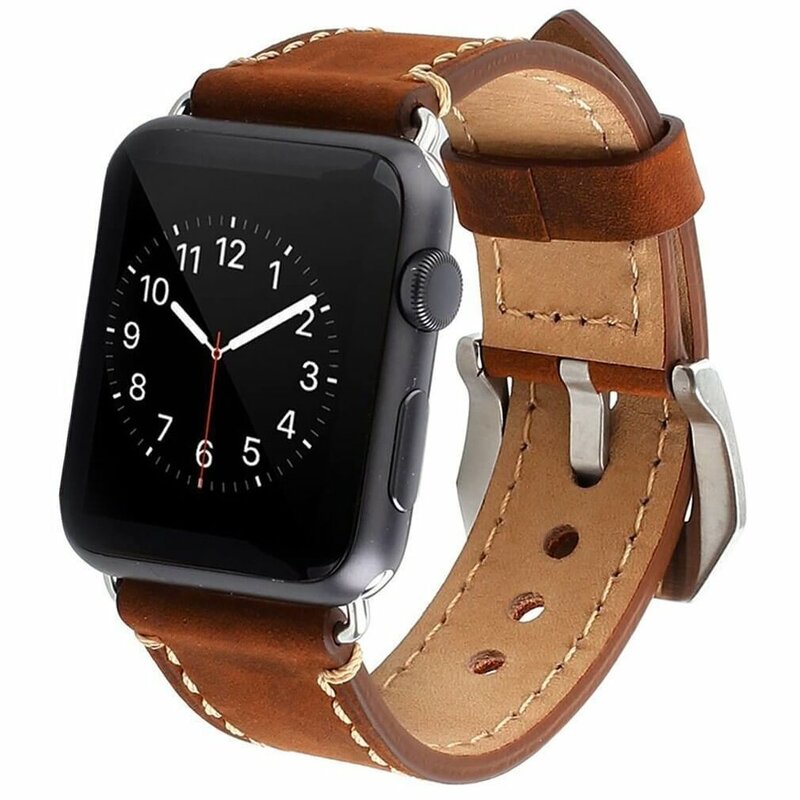 This is a beautiful leather watch band for the apple watch. The connectors fit perfectly as if it was made by apple themselves. I really like the off-white accent stitching around the band as well. I pair it with the "modular" watch face in stone grey and the whole thing just looks great. Explanation: it is compatible with Apple watch 42mm; special note: we just sell the band without the watch. Material: 100% genuine leather band, made of original grassland cattle leather, comfortable, the inner leather is made of 100% real microfiber and was made on the original leather, pure handmade craft with the modern technology; the buckle is made of high-end steel, matte design and not rust; the band adapter is made of original Apple steel, easy to be installed and replaced. Size: standard size, we recommend you choose the correct size based on your wrist’s size. After-sales service: one year warranty and lifetime customer service; please feel free to contact us if you have any further questions; we will solve it for you asap. With over 2000 exceptional reviews and at less than $10 this band offer an amazing value. Everyone should own a Milanese loop band and this one is a must buy. It comes in four colors Black, Silver, Gold and Rose Gold in both 38mm and 42mm. Unique fully magnetic Milanese loop is infinitely adjustable, NO TOOL needed, just stick and lock your watch band easily. Easy to lock into your Apple Watch and one button removal. You can swap easily back and forth with different color or other Apple Watch band. 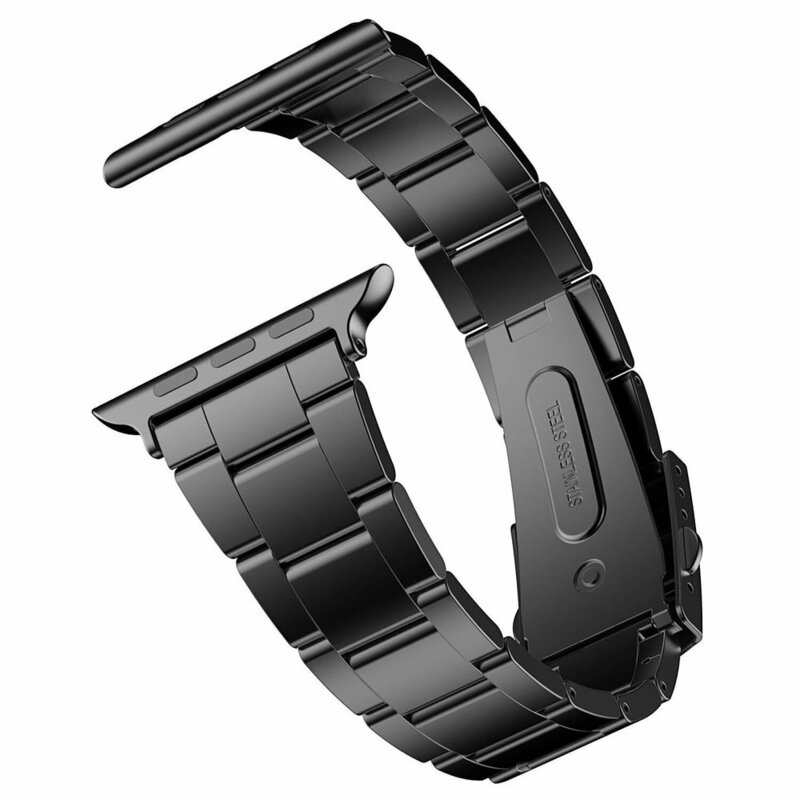 Personalize your iWatch with this refined strap compared to Apple ones, but LESS PRICE. Please recognize the seller name ‘’BRG Tech‘’ when you purchase, beware of imitation, fake and poor products from other seller.